The coat of the Soft-Coated Wheaten Terrier is quite unique. In full bloom, shining and tangle-free, it is a joy to behold, but this is only achieved by effort on the part of the owner. The Wheaten Terrier’s coat is non-shedding: it does not moult. However, the dead hair must still be removed by correct grooming to avoid matting. When you first obtain your Wheaten Terrier puppy, hopefully the breeder will have explained basic grooming and coat care. Long-term Wheaten Terrier owners all have their own methods of grooming. However, for new owners, the following points are offered as a guide to assist you as your pup grows and develops his heavier adult coat. It is best to learn to groom your Wheaten Terrier yourself. Dog grooming parlours are often unfamiliar with the breed and also may not have the time and patience to devote to the thorough grooming the coat requires. Rough handling by an overbooked groomer can upset a dog and make him uncooperative with the grooming process. If you have problems do not hesitate to ask your breeder or your local Club Area Representative for advice or come to Club events where help is always available. It is essential that the puppy is groomed daily. Ensuring he learns to cooperate (and even enjoy) grooming sessions now while his coat is short will save endless struggles in the long run. When a puppy is only 8 weeks old, it takes very little time to groom the coat, but both the coat and the puppy grow very rapidly! Start from the time you get the puppy. Pick a time when he’s had a good romp and is tired and sleepy. Sit on the floor with him and make it a cuddle session going over him gently with any sort of comb. Make sure your comb has long enough teeth to go right through the coat to the skin – you will not hurt the dog. Handle his paws, ears and tail with lots of praise and a few treats. This gets him used to being handled (useful when you take him to the vet) and also is a great way of bonding with your dog. Many owners like to groom their puppy when he is lying on the floor, sleepy and relaxed. Or you can stand the puppy on a firm, non-slippery surface (such as a grooming table or a rubber bath mat). Groom the coat using a fine metal comb. Talk to the puppy, reassuring him if necessary. Gently look at eyes, teeth, and gums. Lift the ears and check for cleanliness. This will accustom your puppy to being handled, which will assist greatly as he gets older. Grooming should be as enjoyable for both of you as possible! Reward the puppy with a cuddle and a treat. As your pup gets older, it is essential to go through the coat carefully with a metal comb. Make sure your comb goes right through the coat to the skin – you will not hurt the dog. Groom away from the skin in the direction of hair growth. You will find that some dead hair comes out as you comb. Try and persuade your Wheaten Terrier that it is delightful fun to lie on his back and have his tummy combed. This will be of benefit later in grooming those quickly matted and hard-to-get-at areas under the legs and on the chest. When checking the ears, gently remove any excess hair from the ear canals, using your thumb and forefinger to pull out a few wisps at a time. This tickles a bit but it is necessary to prevent wax build-up in the ear. (If your fingers slip on the hair, try a little talcum powder on your fingers – but not in the dog’s ear). If required, wipe the underneath of the ear flap with damp cotton wool. DO NOT delve or poke into the ear. If the dog shakes his head excessively, scratches at his ear or the ear is hot and inflamed, it is best to seek veterinary advice. As the puppy’s coat gets longer, it is advisable to tidy the hair around the outer edge of the ear. Carefully trim the hair using blunt-ended scissors and using the shape of the ear as a guide. This keeps the weight of the coat from pulling the ear out of shape and allows the air to circulate into the ear. Gently pick out any goo that has collected in the corner of the eyes. At the tail end, a little baby talcum and a brush will help remove any soiling that sometimes occurs. For this reason, keep the coat under the tail tidied and reasonably short. Veterinary surgeons are now promoting cleaning of dogs’ teeth as a way of preventing ‘tartar’ build up and offensive ‘doggy breath’. Puppies need to become accustomed to you looking into their mouths. You should check his teeth to ensure that his milk teeth are falling out as the permanent teeth come in and that two teeth are not occupying the same site. Do not worry too much – given plenty to chew on, this will usually correct itself with time. The puppy should not need veterinary attention unless the teeth are causing discomfort. Chewing will keep a puppy’s teeth clean at this stage and there are a number of products on the market designed for puppies. Avoid real cooked bones (they splinter) – though raw chicken wings can be given when the teeth start to come through, rawhide strips (they soften and can choke the dog – twists are better) and rubber toys (chunks can be swallowed). Puppy nails grow very quickly and may need frequent cutting. Ask your Vet or an experienced dog owner to show you how it is done, as the nails can be cut too short which is painful for the dog. His dew claws, if he has them, must be periodically trimmed. Check his feet too to make sure there is nothing caught between his pads. While grooming your dog keep an eye out for parasites. As well as being uncomfortable, flea bites can cause allergic reactions in some dogs. Consult your Veterinary Surgeon for the best method of treatment. Around seven months of age the puppy coat starts its gradual change to the adult coat. This takes until he is two to three years old, although all Soft-Coated Wheaten Terriers are individuals. Daily grooming is essential to keep ahead of the tangles. This is the period when most owners run into problems. The puppy coat is coming out as the adult coat is coming in and there is a noticeable increase in the amount of dead hair removed during grooming. If the coat is not combed regularly, it quickly becomes matted and grooming becomes uncomfortable for the dog and a struggle for the owner. This is self-perpetuating – as neither of you enjoys the grooming session, so it gets postponed, making the situation worse! Be of good cheer – this period does end and grooming will probably be twice weekly, depending on your Wheaten’s particular coat. This is also where the good groundwork you have done with the young puppy pays off. If you have made grooming sessions enjoyable for your Wheaten Terrier while he was still little and before there was any apparent need for grooming, he will be cooperative now. A slicker may help during this time (This tool has a rubber base with fine curved wires. The handle is set in the back of the base). Use the slicker first to remove all loose hair and dirt. You must be careful not to use this too energetically or you can pull out the new coat too or damage the ends of the hairs. As the slicker will not get right through the coat, you will then need to comb the dog thoroughly. Start at the neck, part the coat and comb through to the skin. Proceed down the back of the dog in the same way, working in layers. Then comb back the fringe and clean the eyes. Check and clean the ears. Holding the head up, gently brush the hair downward, then comb through. If his dinner has dried on his whiskers, softening the bits with water makes removal easier! If your Wheaten Terrier does get matted, there are various ways to remove these large tangles. You can hold the matted hair and use the first teeth of the comb to gently tease the mat apart. Alternatively, use a pair of thinning scissors and snip into the thickest part, making it easier to comb out in the above manner. If the mat is very dense, have someone hold and reassure the dog, while you work one end of a pair of blunt-ended scissors into the mat close to the dog’s body (Sharp scissors are a real danger to the dog, even in experienced hands!). Cut through the mat in the direction of hair growth, at right angles to the body. The felted mat can now be pulled apart with the fingers and the dead hair gently combed away. As a last resort, if the tangle is really enormous or in a tender part of the dog’s anatomy, sometimes it is better to cut it off, rather than risk really hurting your Wheaten so that he is reluctant to let you groom him again. Do keep the area combed as it is growing in, as new fine hair mats quickly too. For more detailed information on grooming techniques, consider purchasing a copy of our ‘Grooming Guide’ from the Club Shop here on the website. Or check in the Events section to view our upcoming, and hugely popular, grooming workshops. 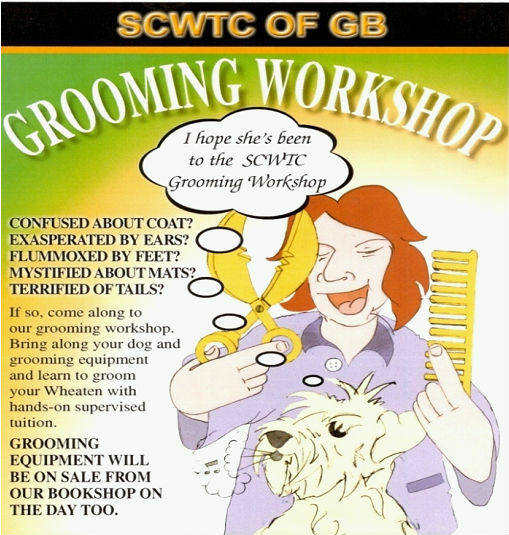 Our Club frequently run Grooming Workshops all over the UK. Details of these workshops will appear in the events section. For less than the price of a visit to the Grooming Parlour our Grooming Workshops have been especially created with the nervous owner in mind; designed to give even the most apprehensive person the skills and confidence to tackle the most unruly of coats. It is equally ideal for those individuals who are ‘just looking’, or researching the breed, or waiting for a puppy of their own. All are welcome. 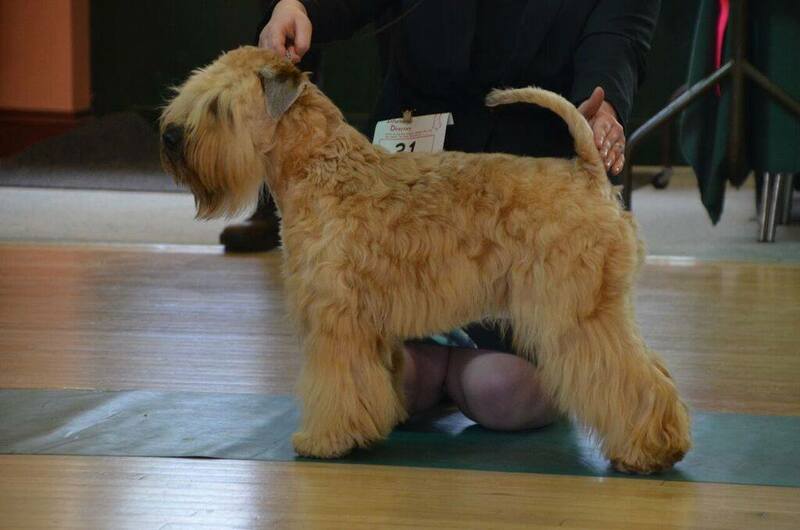 Professional Groomers often attend to learn the correct Soft-Coated Wheaten Terrier presentation. The day’s structure consists of a brief breed introduction over coffee and pastries, which will include coat development, diversity of type, general breed welfare, maintenance and hygiene etc. The various functions of grooming equipment involved are explained and an opportunity is given to purchase scissors and other grooming tools and guides. Under the supervision of the Grooming Buddy team, owners follow a step by step approach following the Principal trainer who gives clear instruction demonstrating each area in turn. Apart from being educational these workshops are a perfect opportunity to meet other owners and their dogs in a calm, structured atmosphere with many returning over and over for a refresher or just a pleasant dog day out. Regarded as very good value for money, as all refreshments and a delicious lunch are included in the price. It is a special delight when the intrepid nervous first time trimmer returns one day as a Grooming Buddy. 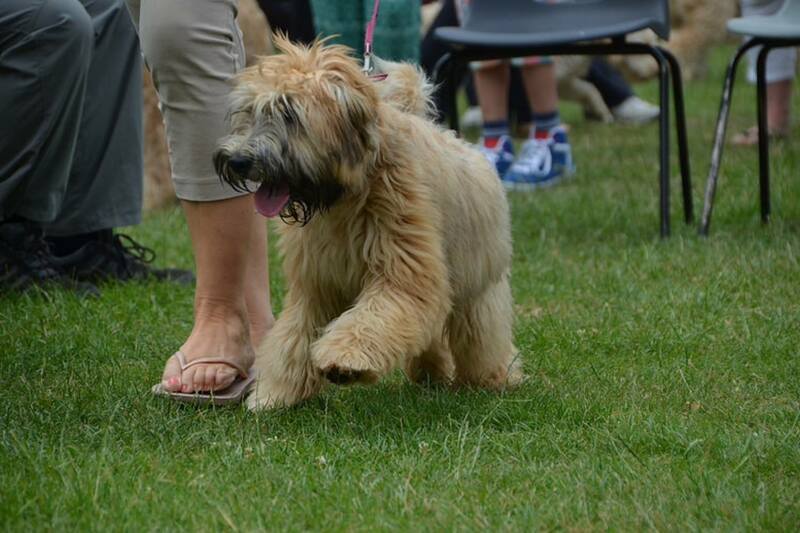 If you would like a Grooming Workshop in your area and know of a suitable dog friendly Hall to hire for the day, and know of about 10 Wheaten Terrier owners who would be interested in attending, then please contact enquiries@wheaten.org.uk and if possible we will arrange one.